Not to be confused with Ilagan. Iligan, officially the City of Iligan (Cebuano: Dakbayan sa Iligan; Tagalog: Lungsod ng Iligan) or referred to as Iligan City, is a 1st class highly urbanized city in Northern Mindanao, Philippines. According to the 2015 census, it has a population of 342,618 people. It is geographically within the province of Lanao del Norte but administered independently from the province. It was once part of Central Mindanao (Region 12) until the province was moved under Northern Mindanao (Region 10) in 2001. Iligan has a total land area of 813.37 square kilometres (314.04 sq mi), making it one of the 10 largest cities in the Philippines in terms of land area. It had a population of 342,618 inhabitants in the 2015 census. The name Iligan is from the Higaunon (Lumad/Native of Iligan) word "Ilig" which means "to go downstream". Iligan City had its beginnings in the village of Bayug, four (4) kilometers north of the present Poblacion. It was the earliest pre-Spanish settlement of native sea dwellers. In the later part of the 16th century, the inhabitants were subdued by the Visayan migrants from the island-nation called the Kedatuan of Dapitan, on Panglao island. In the accounts of Jesuit historian Francisco Combes, the Mollucan Sultan of Ternate invaded Panglao. This caused the Dapitans to flee in large numbers to a re-established Dapitan, Zamboanga del Norte. In Dapitan, the surviving Datu of Panglao Pagbuaya, received Legazpi's expedition in 1595. Later, Pagbuaya's son Manook was baptized Pedro Manuel Manook. Sometime afterwards in by the end of the 16th century after 1595 Manook subdued the higaunon (animist) village of Bayug and turned it into one of the earliest Christian settlements in the country. Although the settlement survived other raids from other enemies, especially Muslims of Lanao, the early settlers and converts moved their settlement from Bayug to Iligan, which the Augustinian Recollects founded in 1609, thus founding the oldest town in northern Mindanao. The Jesuits replaced the Recollects in 1639. Iligan was the Spaniards' base of operations in attempting to conquer and Christianize the Lake Lanao area throughout its history. A stone fort called Fort St. Francis Xavier was built in 1642 where Iliganons sought refuge during raids by bandits. But the fort sank due to floods. Another fort was built and this was named Fort Victoria or Cota de Iligan. In 1850, because of floods, Don Remigio Cabili, then Iligan's governadorcillo, built another fort and moved the poblacion of the old Iligan located at the mouth of Tubod River west of the old market to its present site. Camp Overton in 1900, an American Armybase, currently the location of Global Steel Philippines Inc. Being the oldest town in Northern Mindanao, Iligan was already a part of the once undivided Misamis Province by year 1832. However, it did not have an independent religious administration because its diocese by then was based at Misamis, the provincial capital. It was one of the biggest municipalities of Misamis Province. The Spaniards abandoned Iligan in 1899, paving the way for the landing of the American forces in 1900. In 1903, the Moro Province was created. Iligan, because of its Moro residents, was taken away from the Misamis Province. Then Iligan became the capital of the Lanao District and seat of the government where the American officials lived and held office. Later in 1907 the capital of the Lanao District was transferred to Dansalan. In 1914, under the restructuring of Moroland after the end of the Moro Province (1903–1913), Iligan became a municipality composed of eight barrios together with the municipal district of Mandulog. After enjoying peace and prosperity for about 40 years, Iligan was invaded by Japanese forces in 1942. The liberation in Iligan by the Philippine Commonwealth forces attacked by the Japanese held sway in the city until 1944 to 1945 when the war ended. On November 15, 1944, the city held a Commonwealth Day parade to celebrate the end of Japanese atrocities and occupation. Using the same territorial definition as a municipality, Iligan became a chartered city of Lanao del Norte on June 16, 1950. It was declared a first class city in 1969 and was reclassified as First Class City "A" on July 1, 1977 by virtue of Presidential Decree No. 465. In 1983, Iligan was again reclassified as a highly urbanized city. Republic Act No. 9724, an Act separating the City of Iligan from the First Legislative District of the Province of Lanao del Norte was approved by President Gloria Macapagal Arroyo on October 20, 2009. Iligan City is bounded on the north by the 3 municipalities of Misamis Oriental (namely Lugait, Manticao and Opol), to the south by the 3 municipalities of Lanao del Norte (Baloi, Linamon and Tagoloan) and the 2 municipalities of Lanao del Sur (Kapai and Tagoloan II), to the north-east by Cagayan de Oro City, to the east by the municipality of Talakag, Bukidnon; and to the west by Iligan Bay. To the west, Iligan Bay provides ferry and container ship transportation. East of the city, flat cultivated coastal land gives way to steep volcanic hills and mountains providing the waterfalls and cold springs for which the area is well known. Iligan falls within the third type of climate wherein the seasons are not very pronounced. Rain is more or less evenly distributed throughout the year. Because of its tropical location the city does not experience cold weather. Neither does it experience strong weather disturbances due to its geographical location (being outside the typhoon belt) And also because of the mountains that are surrounding the city. Iliganons are composed of a Cebuano-speaking majority and local minorities, mainly Maranaos, and other cultural minorities and immigrants. It is not only rich in natural resources and industries but it is also the home of a mix of cultures: the Maranaos of Lanao, the Higaonon of Bukidnon, and many settlers and migrants from other parts of the country. It is known for its diverse culture. Cebuano is the major language in the city (92.27%). The rest speak Maranao, Hiligaynon, Ilocano, Chavacano, and Waray. The majority of the population . Majority of the citizens of the Iligan City are Christians (mainly Roman Catholics). 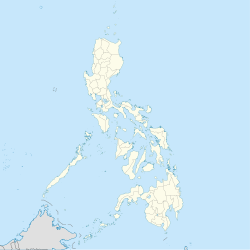 The city is also the center of the Roman Catholic Diocese of Iligan which has 25 parishes in Iligan City and twelve municipalities of Lanao del Norte (Linamon, Kauswagan, Bacolod, Maigo, Kolambugan, Tubod, Baroy, Lala, Kapatagan, Sapad, Salvador, and Magsaysay). It covers an area of 3,092 square kilometers with a population of 1,551,00, which 65.5% of the population are Roman Catholics. Muslims are largest minority which comprises 11.48% of the population and mainly Sunnites. Iligan is known as the Industrial Center of the South and its economy is largely based on heavy industries. It produces hydroelectric power for the Mindanao region through the National Power Corporation (NAPOCOR), the site of the Mindanao Regional Center (MRC) housing Agus V, VI and VII hydroelectric plants. It also houses industries like steel, tinplate, cement and flour mills. After the construction of Maria Cristina (Agus VI) Hydroelectric Plant by National Power Corporation (NPC, NAPOCOR) in 1950, the city experienced rapid industrialization and continued until the late 1980s. The largest steel plant in the country, National Steel Corporation (NSC), was also established in 1962. During the 1997 Asian Financial Crisis, the city experienced severe economic slowdown. A number of industrial plants were closed, notably the National Steel Corporation. The city made its economic revival with the reopening of the National Steel Corporation, renamed Global Steelworks Infrastructures, Inc. (GSII) in 2004. On October 2005, GSII officially took a new corporate name: Global Steel Philippines (SPV-AMC), Inc.
Iligan along with its neighboring city, Cagayan de Oro City, are the two major components for the Cagayan de Oro-Iligan Corridor, the fastest developing area in Northern Mindanao. 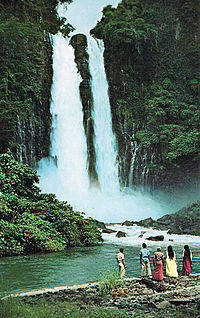 Iligan is known as the "City of Majestic Waterfalls" because of the numerous waterfalls located within its area. There are about 24 waterfalls in the city. The most well known is the Maria Cristina Falls. It is also the primary source of electric power of the city, harnessed by Agus VI Hydroelectric Plant. Diyandi Festival and Street Dancing is Iligan City's month-long cultural celebration held every month of September and concludes on the feast day of Saint Michael the Archangel on September 29. The highlight of the event is Kasadya Street Dancing, a Comedia or ritual dance offered to the patron saint as thanksgiving. The Kasadya Merry Making and Street Dancing has been renamed Sayaw Saulog in 2014. Michael, the Archangel is widely regarded as the patron saint of the beloved city. The city fiesta in devotion to him is considered being one of the Largest Religious Fiesta All over Mindanao and rising being ranked as one of the Pilgrim Festivals in the Major Islands of the country such as Traslacion of the Black Nazarene held in Manila, Peñafracia Festival of Bicol Region in Luzon and the Sinulog Festival in honor of Señor Sto Niño of Cebu in Visayas. it is held every September 29 the Actual Feastday of the Archangel. He is locally known by the Spanish version of his name, Señor San Miguel. Devotion to him is common to Muslims and Christians in Iligan as he is mentioned in all the sacred scriptures both the Bible and Koran. Iligan City is a highly urbanized city and is politically independent from the Province of Lanao del Norte. Registered voters of the city no longer vote for provincial candidates such as the Governor and Vice Governor unlike its nearby towns that make up the provinces as a result of its charter as a city in the 1950s. Iligan City's seat of government, the city hall, is located at Buhanginan Hills in Barangay Pala-o. The local government structure is composed of one mayor, one vice mayor and twelve councilors. Each official is elected publicly to a 3-year term and can be re-elected up to 3 terms in succession. The day-to-day administration of the city is handled by the city administrator. The Port of Iligan is located along the northern central coastal area of Mindanao facing the Iligan Bay with geographical coordinates of approximately 8°13′56″N 124°13′54″E﻿ / ﻿8.23222°N 124.23167°E﻿ / 8.23222; 124.23167. It serves the port users and passengers coming from the hinterlands of the provinces of Lanao del Norte, Lanao del Sur, parts of Misamis Oriental, and the Cities of Iligan and Marawi. Passenger and cargo shipping lines operating in the Port of Iligan serves the cities of Manila, Cebu City, and Ozamiz. There are around seven private seaports in Iligan operated by their respective heavy industry companies. These private seaports can be found in Barangays Maria Cristina, Suarez, Tomas L. Cabili, Sta. Filomena, and Kiwalan. The main airport is Laguindingan Airport, located in the municipality of Laguindingan, Misamis Oriental, which opened on June 15, 2013, the airport replaced Lumbia Airport as the main airport of Misamis Oriental and Northern Mindanao. It has daily commercial flights to and from Manila, Cebu, Davao, Zamboanga, Tagbilaran, Iloilo, Bacolod, Caticlan, Dumaguete and Clark via Philippine Airlines and Cebu Pacific. Maria Cristina Airport, is located in Balo-i, Lanao del Norte, and was the main airport of Iligan in the late 1980s. Aerolift Philippines, a now-defunct regional airline, ceased its services when its passenger plane crashed into some structures at the end of the runway of the Manila Domestic Airport in 1990 which resulted to its bankruptcy. Thus, it ended its service to Iligan's airport at Balo-i which also resulted in the closure of the airport. Philippine Airlines served the city for many years before ending flights in 1998 due to the Asian financial crisis. There are two main bus terminals in Iligan. The Integrated Bus and Jeepney Terminal (IBJT), caters trips to and from Cagayan de Oro City and various parts of Misamis Oriental. Southbound Bus and Jeepney Terminal, caters trips to and from Dipolog City, Pagadian City, Cotabato City, Ozamiz City, Zamboanga City, and various parts of Lanao del Norte and Marawi City. Rural Transit (RTMI) and Super 5 Transport are the dominant public bus companies with daily trips from and to Iligan. Passenger vans and jeeps also services various municipalities in Lanao del Norte, Lanao del Sur, and Misamis Oriental. The public modes of transportation within the city are Jeepneys, Taxis, and Pedicabs. "Tartanillas" service main roads in Barangay Pala-o and Barangay Tambacan. The City of Iligan has one state university and seven private colleges specialized in Engineering and Information Technology, Health Services, Maritime Science, Business and Administration, Primary and Secondary Education, and Arts and Social Sciences. With a total of 181 schools (106 public; 75 private; 17 madaris) including vocational and technical schools, Iligan City has an average literacy rate of 94.71, one of the highest in the whole Philippines. The Mindanao State University – Iligan Institute of Technology (MSU-IIT) is one of the few autonomous external campuses of the Mindanao State University and "the light-bearer of the several campuses of the MSU System." It is not only one of the best universities in the Visayas and Mindanao regions but considered as well as one of the best universities in Philippines with a standing of being within the top ten (10) best universities in the country with excellence in Science and Technology, Engineering, Mathematics, Information Technology, and Natural Sciences. St. Michael's College, Iligan City, is known as the oldest school in the Lanao area, founded as a catechetical center way back 1914 by Fr. Felix Cordova, S.J. It was formally established in 1915 as Escuela de San Miguel in honor of the patron saint, St. Michael the Archangel. Now on its active bid to become the city's first Private Catholic University, Saint Michael's College of Iligan currently offers 8 disciplines: Business Administration, Accountancy, Hotel and Restaurant Management, Engineering and Computer Studies, Nursing, Criminology, Education, Arts and Sciences and the Basic Education. It also offers the TESDA Ladderized Courses and the education - related Graduate Studies Program. St. Peter's College, Iligan City, is an engineering, accounting and business administration school founded in 1952. Capitol College of Iligan, Inc., more popularly known as Iligan Capitol College (ICC), is a private, non-sectarian, co-educational institution of learning which was established in 1963 by the late Engr. Sesenio S. Rosales and Madame Laureana San Pedro Rosales. It was registered with the Securities and Exchange Commission (SEC) on February 12, 1964. In 1997, Iligan Capitol College established Lyceum Foundation of Iligan which is to become its sister college beside Corpus Christi Parish in Tubod, Iligan City. Iligan Medical Center College, is a private and non-sectarian Medicine and Health Services school founded in 1975. Adventist Medical Center College, formerly: Mindanao Sanitarium and Hospital College, is one of the colleges of the Seventh-day Adventist Church. It is a medical school which focuses on healthcare courses like Nursing, Medical Technology, Physical Therapy, Pharmacy and Radiology. Lyceum of Iligan Foundation focuses on maritime and engineering courses. It also offers courses on Hotel and Restaurant Management, Nursing, Business Administration, and other allied Health Services. Other notable colleges and technical schools are Iligan Computer Institute, (ICTSI), Santa Monica Institute of Technology (SMIT), STI College, AMA Computer College, Picardal Institute of Technology (PISTEch), Saint Lawrence Institute of Technology, Masters Technological Institute of Mindanao, and ICTI Polytechnic College, Inc. (formerly Iligan City Technical Institute (ICTI)). Iligan City National High School, the largest high school campus in Iligan City. Lanao Chung Hua School, the first and only Chinese school in Iligan City which was founded in November 12, 1938. La Salle Academy (Iligan City) is a Lasallian school located in Iligan City, Lanao del Norte, Philippines. It is the first of the third generation of La Salle schools founded by the De La Salle Brothers in the country. Iligan City East National High School, formerly known as Regional Science High School for Region XII but was then transferred to Cagayan de Oro and was changed into Iligan City East National High School. The School was founded on February 1986. Specializes on research, sciences, mathematics, technology education and others. Integrated Developmental School, founded as Iligan High School, was established in 1946. On July 12, 1968, the school was annexed to Mindanao State University - Iligan Institute of Technology under R.A. 5363. ^ a b "Province: Lanao del Norte". PSGC Interactive. Quezon City, Philippines: Philippine Statistics Authority. Retrieved 12 November 2016. ^ Godinez-Ortega, C. (2001, September 9). 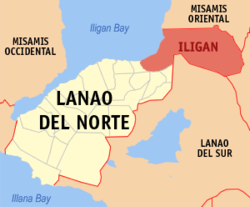 Iligan City 'moves' to Northern Mindanao, Philippine Daily Inquirer. P. A13. ^ "R.A. No. 525, Iligan City Charter". LawPH.com. Archived from the original on 2012-07-20. Retrieved 2011-04-09. ^ "Province of Lanao del Norte". Municipality Population Data. Local Water Utilities Administration Research Division. Retrieved 17 December 2016. ^ "Lakbay Pilipinas Iligan City". Lakbay Pilipinas. ^ Diocese of Iligan (July 26, 2017). "Diocese of Iligan Statistics". Retrieved Aug 31, 2018. ^ Philippine Statistics Authority (July 26, 2017). "Muslim Population in Mindanao (based on POPCEN 2015". Retrieved Aug 31, 2018. ^ Amojelar, D. (2013, April 16). Gov't defers transfer of flights to Laguindingan Airport until after summer, Retrieved 2013, April 18, from www.interaksyon.com. ^ Betonio, T., Managbanag, N. (2013, February 27). Laguindingan airport to open in April, Retrieved 2013, April 18, from www.sunstar.com.ph. ^ "Aviation Safety Database, Accident Description". Aviation-safety.net. 1990-05-18. Retrieved 2013-09-14. ^ "The Philippines Air Accidents 1990-1999". Baaa-acro.com. Archived from the original on 2014-07-14. Retrieved 2013-09-14. ^ Macapado A. Muslim, "Commencement Address", a speech at MSU IIT's 38th Commencement Exercises, MSU-IIT Gymnasium, Iligan City, April 4, 2008. ^ a b Iligan City Schools, City Development Strategies in Philippines. Wikimedia Commons has media related to Iligan City. Wikivoyage has a travel guide for Iligan.